Kitsap Veterinary Hospital’s experienced support staff strive to provide personalized, compassionate care for our patients and clients alike. 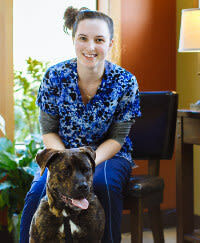 Mike joined Kitsap Veterinary Hospital in February of 2018. He attended Michigan State University and after managing the MSU Wildlife Toxicology Laboratory for ten years, it was time for a change. In 2016, along with wife Justine, they moved to the Kitsap Peninsula from Michigan. She is a Veterinarian at another local hospital in Silverdale, WA. They live in Port Orchard with their son Jaxon. 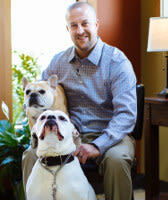 The four legged family members are Lucy and Lola, an American Bulldog and a French Bulldog. Outside the hospital, he enjoys spending time with his family. They enjoy everything the Pacific Northwest has to offer including hiking, biking, backpacking, camping, kayaking, fishing, and anything else outdoors. Cassie joined our team in 2016 and we are thrilled to have her! She has one cat named Chanel, she enjoys sports and being with her friends. Her favorite part about veterinary medicine is that there is always something new and different coming through the door. She is hoping to go to school to become a Licensed Veterinary Technician! Saleena has been with us since 2015, and has been a fantastic addition to our team! She is a hard worker and puts 110% into every pet she treats! She has 2 cats: Chi and Yuki; and 2 dogs: Eddie the Magnificent and Princess Fiona. She enjoys video games and coloring books. She has lived in Bremerton since she was 3 years old. She graduated from PIMA’s Veterinary Assistant program in 2015 and hopes to go back to school to get her certification as a Licensed Veterinary Technician. 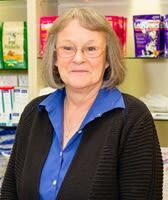 Kathy is truly a pillar at Kitsap Veterinary Hospital as she has been with us since 1999. 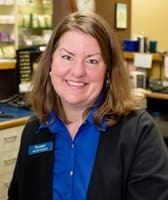 Because she was born, raised and has lived in Port Orchard her whole life, you can always count on her to know you and your family, greeting you by name, making you feel welcome. She and her husband Lenn have raised two boys they are very proud of, “good kids”. In addition to enjoying a gentler hobby of cross-stitch, you can often find her at the ocean amongst the big kite flyers, or reading or watching “who done it” stories and camping with the family. Her humor and unexpected jokes have earned her the nickname of Trouble here at Kitsap Veterinary Hospital. With the kids grown, she and Lenn share their home with their springer spaniel, Delilah. Leah joined us in 2016 and we have been thrilled to have her! Leah has 2 cats, Sadie and Zoe along with 1 dog, an English Bulldog/Schnauzer named Max. Her favorite part of veterinary medicine is saving lives and she hopes to go to school to become a Licensed Veterinary Technician. Leah was adopted as a teenager and feels she can relate to what pets must feel when we adopt them! When not helping to save furry lives, Leah enjoys DIY projects, reading, hiking, sporting events and exploring. Susan is originally from Florida. She has had a passion for animals since her first puppy, Frisky. She takes great pride in the customer service she provides. She believes the pet’s best interest is always the number one priority and goes out of her way to make them feel welcomed along with their owners. She enjoys her free time with her husband and their dog Rascal. She has many interests such as photography, gardening, traveling, football, long walks, theater, cooking/baking, crafts, snowmobiling and keeping in touch with family and friends. Her smile and laugh are contagious! Her motto is “dance in life, enjoy it to the fullest”.